New British Airways Club World Seat. 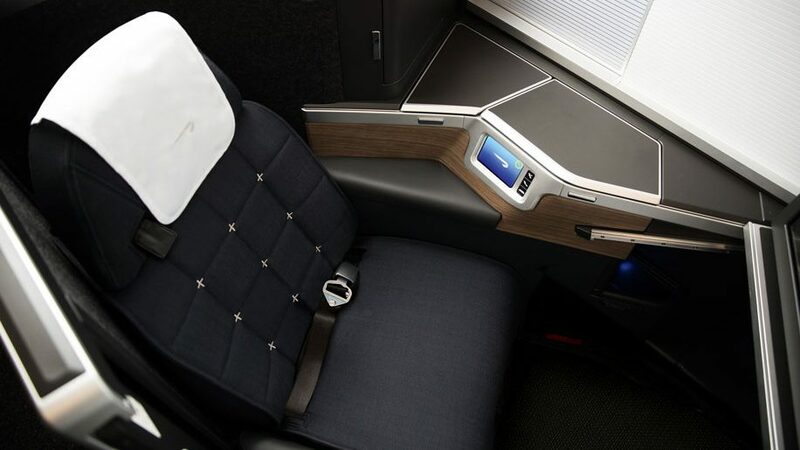 British Airways today unveiled the new Club World Business Class seat which will debut on the first Airbus A350-1000 deliveries and will also be refitted to the Boeing 777 fleet commencing this year. The new seat is a Collins Aerospace Super Diamond in reverse herringbone 1 – 2 – 1 configuration but with individual seat doors and will be marketed as the Club Suite. This is the first use of doors on seats in this configuration. British Airways B777-200 G-ZZZB BA185 Keflavik Diversion. British Airways Boeing 777-236 G-ZZZB operating BA185 London Heathrow – Newark diverted to Keflavik this afternoon due to smoke in the cabin. As a result BA184 Newark – London Heathrow was cancelled. Buy On Board Commences on British Airways Shorthaul. British Airways European and UK Domestic services had buy-on-board Marks and Spencer service introduced today with the exception of any flights operated by aircraft which night-stopped at outstations which provided the previous service on the first sector of the day. British Airways Announces Gatwick 3 Class B777-200ER Densification. At today’s Capital Markets Day presentation British Airways announced that the 40J/24W/216Y configured London Gatwick Boeing 777-200ER fleet will be reconfigured to 32J/48W/252Y configuration with ten abreast seating in Economy Class from early 2018. With the addition of 52 seats comes the removal of three toilets. At present there are five aircraft in 40J/24W/216Y configuration, however the presentation states that 25 Boeing 777s will be converted to ten abreast seating in Economy. It is not clear what the other twenty aircraft are. British Airways Announce End of Inclusive Shorthaul Economy Class Catering. British Airways today announced that from 11th January 2017 it will remove all Shorthaul inclusive Economy Class catering on services from London Heathrow and London Gatwick, with services from London City and London Stansted following suit at some time during the Summer of 2017. A new buy-on-board food offering from Marks and Spencer will be available. All drinks, with the exception of potable water from the aircraft tanks, will also become a buy-on-board item and these will be provided from within the existing BA supply chain. Payment will only be available via contactless credit and debit cards or Avios points. British Airways A320 G-EUUI Edinburgh Technical Issue. British Airways A320 G-EUUI overnighted at Edinburgh after arriving as BA1462 from London Heathrow, however its scheduled return to London Heathrow as BA1461 was cancelled this morning due to a technical issue. British Airways Longhaul Fleet to Get Gogo 2Ku Wifi. IAG today announced that the British Airways longhaul fleet will be fitted with the Gogo 2Ku wifi system commencing in 2017. 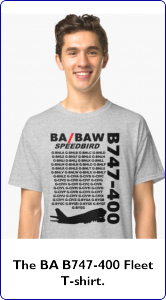 This will encompass 18 Boeing 747-400s and the Boeing 777-200, Boeing 777-200ER, Boeing 777-300ER and A380 fleets. BA CityFlyer E190 G-LCYU BA3279 Pisa Diversion. BA CityFlyer Embraer 190 G-LCYU operating BA3279 London City – Florence diverted to Pisa this afternoon due to weather at Florence. The return BA3280 operated from Pisa once passengers had been transferred by road. IAG Capital Markets Day Presentation Reveals B777-200ER Fleet Plans. The IAG Capital Markets Day Presentation released today revealed plans for the British Airways Boeing 777-200ER fleet. The fleet’s life will be extended with aircraft operating a 30 year service life. London Gatwick based aircraft will see a reduction in the size of the Club World cabin meaning an increase in capacity of around 10%. London Heathrow based Four Class aircraft will be converted to Three Class configuration seeing an increase in capacity of around 25%. These capacity increase percentages indicate that the Economy Class cabins will remain in 3-3-3 configuration and will not be increased to 3-4-3 configuration. British Airways November 2016 Gatwick South Move Official. British Airways officially acknowledged today that it will switch its London Gatwick operation from the North Terminal to the South Terminal in November 2016. The move will see new Check In and Lounge facilities constructed at the South Terminal. British Airways Announces B747-400 Cabin Refresh Program. British Airways today announced that eighteen Boeing 747-400 aircraft will go through a cabin refresh program which will commence in August 2015 and be completed by August 2016. The aircraft will be fitted with the Panasonic eX3 IFE system in all classes. 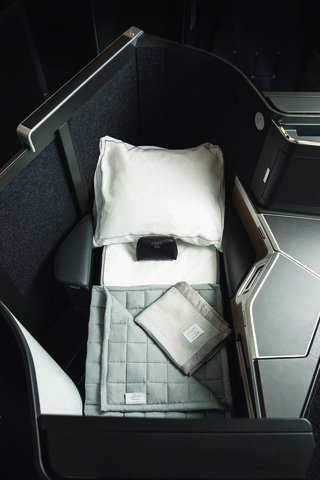 The World Traveller and World Traveller Plus cabins will be fitted with new seat foams and covers to match the A380, Boeing 777-300ER and refurbished B777-200/200ER fleets, and new carpets and curtains will be fitted in all cabins. Additionally Economy passengers will have access to a Universal Power Socket and a USB Port. British Airways A321 G-EUXI Operates Lemnos Charter. British Airways A321 G-EUXI operated a London Heathrow – Lemnos charter rotation this morning as BA9226/BA9227. Old First to Become Business Class on B747-400 Routes. BA289/BA288 London Heathrow – Phoenix. These flights will be allocated to Old First fitted Boeing 747-400s. On these services should more than 52 Business Class seats be sold then the First Class cabin will be opened up for high status Business Class passengers, although with Business Class service. British Airways A320 G-EUUO Overnight Milan Linate Delay. British Airways A320 G-EUUO operated BA564 London Heathrow – Milan Linate this morning, however the return BA565 was cancelled. It is not clear whether the aircraft encountered a technical issue or could not operate due to today’s UK Air Traffic Control issues. British Airways B787-8 G-ZBJA Training Flights. BA9163 Paris Vatry – Manston. BA Trial “Hand Baggage Only” Fares. British Airways today released “hand baggage only” fares on its routes from London Gatwick – Amsterdam, Dubrovnik, Jersey, Tunis and Turin for travel from February 26th. The fares represent a saving of £9-16 per way over the cheapest standard fares. If successful, the scheme will be rolled out across all routes from London Gatwick. British Airways B767-300ER G-BNWU Operates Cairo Rotation. British Airways Boeing 767-336ER G-BNWU operated the BA155/BA154 London Heathrow – Cairo rotation today. Boeing 767-300ERs will operate this service until 29th March 2013 allowing maintenance on the mid-haul A321 fleet. British Airways A321 G-MEDJ Returns in Union Flag Livery. British Airways A321 G-MEDJ, which has been out of service at London Heathrow since 17th December, returned to service today in Union Flag with Crest livery operating the BA145/BA144 London Heathrow – Baku rotation. 25/09/12 British Airways Flight Cancellations. BA8178 London Heathrow – Amman. B767-300ER G-BNWU Operates Diverted BA255. British Airways Boeing 767-336ER G-BNWU operated tonight’s BA255 London Heathrow – Lusaka routing London Heathrow – Dar Es Salaam – Lusaka in order to drop engineers and/or parts to Dar Es Salaam for stricken sister G-BNWH.